Project Match, as it is called, has helped make the company’s HP T410 Inkjet Web Press a workhorse. In addition to high-end, full-page imaging, the project inserts into each ad personalized messages and a personal QR code based on information gleaned from the subscriber database—and it all needs to be done fast, as rapidly as within three days of getting the subscriber list. The result for the advertiser is an ability to track responses to a print ad that had only been possible online, as well as more relevant messaging that boosts response rates. A similar project that SCI had completed for Popular Mechanics saw a 5% response (vs. the more typical 1%) and of that 5%, 80% opted into the online components of the campaign. “It involves a lot of math and a lot of logistics,” says Kevin McVea, SCI’s senior vice president. 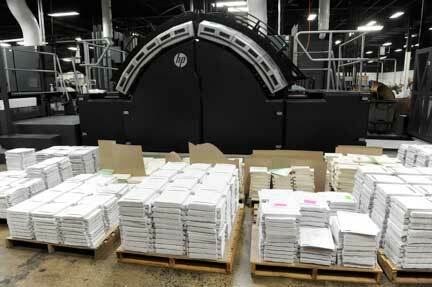 And, he adds, “A challenging issue was the heavy heavy coverage of inkjet.” Such that for a recent ad for Neiman Marcus the company had to instead use the their HP Indigo, which was combined with a Scodix finishing effect. Or, in other words, “We stay on the bleeding edge to take the customer to the next level,” says McVea. Through a combination of workflow automation and customized print capabilities, SCI is producing on-demand textbooks for McGraw-Hill Education and Pearson Education, with an automatic replenishment system and a “virtual warehouse” that turns the traditional book publishing supply chain on its head. Likewise, SCI produces more than 30 academic journal titles for the American Chemical Society using a print-on-demand system for both first editions and back orders. And the company’s programs for producing the Medicare Annual Notice of Change (ANOC) documentation involve personalized kit production as well as the ability to run lightweight papers to help insurers reduce postal costs. Each of the vertical markets that SCI servers—academic publishing, health care—has its peak periods and slow times. Educational publishing peaks in the summer before the fall semester begins and slows down just in time for health care’s open enrollment period in September, so plant throughput can be optimized. In addition to the HP Inkjet Web Press, SCI also has Xeikon and HP Indigo presses, as well as a variety of binding capabilities—perfect binding, case binding, saddle-stitching, you name it—all highly data-controlled and automated. Integrating new print and logistics technology has helped SCI expand dramatically—in fact, the company is about to undergo its third move to search for bigger space. The secret, says Burt Scherman, SCI’s president and CEO, “is to pick your focus and stick with it.” Part of that focus is not so much on the physical printing technology, but the software that controls it. “It’s certainly not for the faint of heart,” Scherman says. Burt nails it with: "Ultimately, it’s all about the customers creating profits. You still have to be competitive, but at least you’re part of a success.”"
SCI is a very innovative company constantly re-creating the rules for variable data. From all of us here at Magnum Digital Solutions we are proud of our association with their talented team and selected as their inline finishing partner for both of their high speed HP Inkjet webs. It is a pleasure re-defining short run print with them.